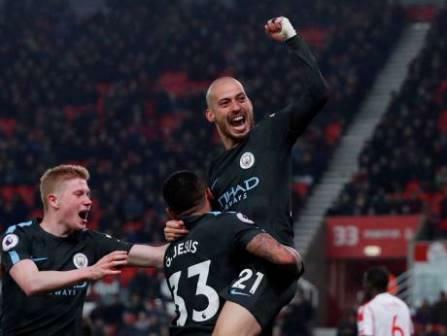 Manchester: David Silva scored two magnificent goals as Manchester City moved a step closer to their first Premier League title under Pep Guardiola with a comfortable 2-0 victory at struggling Stoke on Monday. After re-establishing a 16-point lead at the top of the table, the latest victory leaves City still with the potential to clinch the title at the start of April when they host second-placed local rivals United in the Manchester derby. It took just nine minutes for City to carve open a Stoke side that is looking increasingly certain to suffer relegation this season with every passing week. As has been then case so many times this season, the goal came with devastating pace and precision on the counter-attack after striker Gabriel Jesus had dropped deep and become involved in build-up play. He slipped through a perfect pass for Raheem Sterling, sprinting down the right wing, and the England forward’s first-time cross picked out the run of Silva who arrived to convert without hesitation from 12 yards. For a Stoke side with just one victory in their previous 10 league games, it was the stuff of nightmares and, given the ease with which Guardiola’s team was moving the ball around, it was hard to see a way back for Paul Lambert’s men. Yet the next meaningful attack came from the struggling hosts and might have resulted in an unlikely equaliser. Xherdan Shaqiri, with the ball on the by-line, pushed it through the legs of full-back Oleksandr Zinchenko and cut it back to the edge of the area for Badou Ndiaye whose shot was deflected behind for a corner. It was a rare positive moment for Stoke and one that was short-lived with City soon pressing for a second goal. After 26 minutes, an exquisite Kevin De Bruyne cross appeared to have set up Silva for a chance only for the Spaniard to miskick six yards out, with Fernandinho sending the rebound over. Jack Butland was forced to beat De Bruyne to a weak back-pass from Bruno Martins Indi, Jesus just missed connecting with a free-kick close to goal and, as the half closed, Butland saved well from Fernandinho before Leroy Sane volleyed wide. Even when City goalkeeper Ederson was forced into his first serious action of the evening, it was from his own player, as Kyle Walker intercepted Butland’s long clearance with a deflection the Brazilian was forced to tip over his crossbar. By the time Silva claimed his, and City’s, second goal from the first attack of the second half, it was difficult to see a route back for the home side. This effort was as pleasing on the eye as the first, after Fernandinho won the ball and played in Silva who exchanged perfect passes with Jesus. It was left for Silva to finish, over the body of Butland as the goalkeeper rushed out, capping a performance that was all the more remarkable given the Spaniard has recently been returning to his homeland on a regular basis to spend time with his new-born son. The 50th-minute strike saw City’s confidence grow even greater, with Jesus shooting into the side netting and Sterling’s tricky footwork seeing him almost walk the ball into the Stoke net before flicking against Butland. Sane’s curling 25-yard shot might have made it three and, when Ndiaye glimpsed a rare chance for the hosts only to volley over from six yards from Maxim Choupo-Moting’s header, Stoke were doomed. Walker shot wide for the visitors while a Sane effort was well saved by Butland, before a controversial moment in the 80th minute when Sterling dispossessed Ndiaye from a drop ball which Stoke thought they would be allowed to play after the game was stopped for injuries. Sterling advanced and appeared about to score before Ndiaye made a recovering tackle.